In 1143, Robert ‘le Bossu,’ the second earl of Leicester, founded the Abbey of St. Mary de Pratis (of the Meadows) in honour of the Virgin Mary. 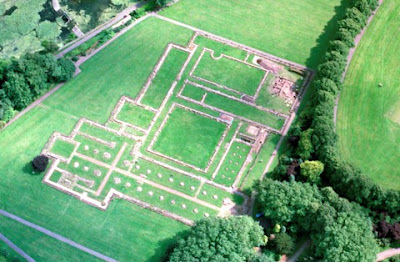 Situated on the south bank of the River Soar in what is now Abbey Park, about a mile north of the city of Leicester, the abbey became the most important religious building in the county. After its construction, all the possessions and wealth of the Collegiate Church of St. Mary de Castro, built by Robert’s father, Robert de Beaumont, were transferred to the new abbey, making it considerably well off. Over the years it grew into the second richest abbey in the country. The abbey was also one the largest and most influential landowners in Leicestershire, with more manors in it’s possession than any lord. It’s contributors included Simon de Montfort, Alan la Zouche, the Earl of Winchester and of course, the Crown. It was founded as a community of Augustinian Canons who were known as the ‘Black Canons’ because they wore black cassocks and a black biretta (hat), but some believe it is because secret dark arts were practiced within the abbey walls. The canons followed a rule set down by Saint Augustine in a letter he wrote in 423 when he was Bishop of Hippo. This rule was not as strict as other orders and unlike monks, all canons were ordained. The new Augustinian house did not altogether replace St. Mary de Castro, which continued to exist under the control of the abbey, as were all the churches in Leicester, the church of Lilbourne in Northants, and the Manor of Asfordby. Earl Robert ‘le Bossu’ (the Hunchback) added the churches of Knaptoft, Erdesby, Cosby, Stoney Stanton, Whetstone, Shepshed, Knighton, Illston and Thurnby, and others from the neighbouring counties. Before 1162, just about every church in Leicestershire was under orders from the abbey, including St. Mary’s Church in Humberstone. After the Norman Conquest in 1066, the lands of Humberstone were given to Hugh de Grentemaisnil, the first owner of Leicester after the conquest. But the first church was built by Robert ‘le Bossu’ at the same time as he built Leicester Abbey, and consisted of a simple nave and chancel in the Norman style. Interestingly, both Leicester Abbey and the church at Humberstone were dedicated to the Virgin Mary and both are said to be linked by a secret underground tunnel. More interestingly both the abbey and Humberstone church are built so that they are directly facing each other. If you open up a map of Leicester and draw a line running straight through the long axis of the abbey’s main church and trace it some 3 miles eastwards, you end up at St. Mary’s church in Humberstone, again running straight through the long axis of the building. Both could be seen from each other when viewed from high up from their respective stone towers. Humberstone was a very important settlement in Norman Leicester, as it was a resting place for the canons as they travelled to and from Launde Abbey in the east, hence the crude name of a now-dissapeared village building – the Monk’s Rest. Now remembered by the name of the village park, also called the Monk’s Rest, the building stood close to the church and there is another tunnel reputed to have run between them. A third tunnel was also apparently discovered during the English Civil War, as a group of Royalists who were locked inside Humberstone church, emerged via a tunnel, at a nearby nunnery. On exiting the tunnel, they are said to have moved the fabled Humber Stone over its mouth so that they could not be followed. Investigations of tunnels have never taken place in the village or at the Humber Stone, but as the Norman’s and especially Robert ‘le Bossu’ were known as master builders, and as the underlying geology of east Leicester is relatively soft, the tunnel theory is not all that impossible. Earl Robert ‘le Bossu’ was well involved with the abbey and he even spent the last years of his life as a canon. Together with Alexander, Bishop of Lincoln, Robert laid down certain regulations for the abbey to adhere to, and these were later confirmed by Pope Urban III. Robert died in 1168 and was buried in the prebytery, on the right hand side of the altar within the abbey church. On his death, the abbey, like the castle of Leicester, was passed down through the generations to each succeeding de Beaumont earl of Leicester, and they all added considerably to its structure. Petronilla, the wife of earl Robert Blanchemains, loved the abbey so much she paid for the nave of the church to be built. She was said to have plaited a long cord from her hair from which one of the lamps in the choir could be hung. For worshippers this became a treasured relic and became the basis of a well-told story, passed down over the years to the inhabitants of Leicester. After the de Beaumont rule of Leicester, the abbey was in the hands of the Lancastrian earls. In October 1326, a violent attack was made on the abbey by the Earl of Lancaster’s own followers, who broke in and seized the property of Hugh Despenser, stored in the abbey for safe keeping. The glory years of the abbey were when it was under the control of Abbot William Clowne, who was elected in 1345. Under his influence, the abbey enjoyed great prosperity and Clowne is descibed in most favourable terms in the writings of a canon of the abbey. 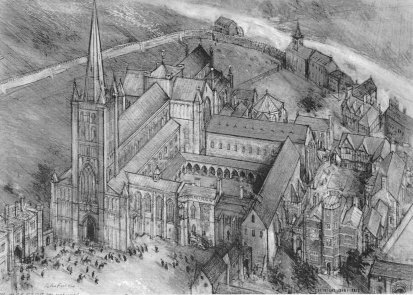 In his time, Leicester became head of four other Augustinian houses and acquired a great deal of land and even more churches. Clowne’s close friendship with Edward III surely played a part in his power and wealth and also for the way he secured exemption for the abbots of Leicester from attendance at Parliament, a duty imposed on the abbots since 1265. It was also during Clowne’s abbacy that Henry of Knighton, a canon of Leicester Abbey, began to write his famous chronicle. Clowne died in 1378, afterwhich the abbey entered a difficult period. In the late fourteenth and early fifteenth centuries, the income obtained from the abbey’s lands began to decline, so were leased out to anyone willing to buy them. The abbey, once a major producer of corn and wool, now had only the immediate surrounding lands in Leicester, Stoughton and Ingarsby to rely on for cultivation. A further problem came with a particular canon of the abbey, Philip Repingdon, who whilst studying at Oxford, became one of the great Wycliffe’s followers and in 1382 Repington’s opinions were declared heritical. As a learned man, Repingdon recanted and went on to become the elected Abbot of Leicester in 1392, and eventually Bishop of Lincoln in 1405. But it appears that Repingdon didn’t get on with his canons and only seven years after becoming bishop, the canons of Leicester Abbey obtained a royal licence permitting them to obtain from the Pope, exemption from Repingdon’s jurisdiction so long as he was bishop. This law was nullified the following year and Repingdon obtained a declaration from the Pope that Leicester Abbey should be fully subject to him and his successors. By the time of Bishop Alnwick’s visitation in 1440, the number of canons at the abbey had fallen to a mere fourteen, a figure substantially lower than the thirty to forty who used to dwell there. The number of boys in the almonry was also reduced from about twenty-five to only six, and the abbot in charge was accused of admitting unsuitable boys in return for money. The abbot at this time was Sadington, a man who kept a tight grip on the financial affairs of the abbey whilst pocketing various minor revenues for himself. He kept the offices of treasurer and cellarer in his own right but failed to render accounts to his canons. He also kept many lay servants, some of whom he favoured excessively, and he was also said to have indulged in occultist ‘magical practices.’ No serious immorality was disclosed on the Bishop’s visitation and Sadington managed to clear himself of the charge that he had practiced divination. After his visit, Bishop Alnwick ordered that the number of canons should rise back up to thirty, with at least sixteen boys in the almonry. The abbot was ordered to render accounts properly to his brethren and to behave more charitably towards his canons. Little is known of the internal affairs of the abbey in the years that followed, but in 1518 William Charyte, Prior of Leicester and second only to the abbot, drew up an elaborate record of the possessions of the house. The books that were produced were kept in the abbey’s library and consisted of over 900 volumes. Many of the faults discovered in 1440 were still apparent under the leadership of the new abbot Pescall and he was charged with keeping financial control too much. Also, like when the abbey was under the control of Sadington, the boys in the almonry were not properly educated. There was also an excessive amount of hounds kept within the abbey grounds and many canons were in the habit of eating and drinking at unaccustomed hours. The Bishop Attwater tried to deal with some of the problems at Leicester Abbey but when Bishop Longland came to power in 1521, the abbey was seen in the most unfavoured light. Pescall was extremely remiss in his attendance at the divine offices in the abbey’s church, and when he did enter, he was accompanied by ‘his fool’ who disturbed the services by “his buffoonery.” The canons were also lax in their attendance in choir. With twenty-five of them in the house, only eleven were present at any one time. Most were accustomed to roam about outside the monastery and two were also suspected of incontinence. The abbey was falling into financial ruin and Bishop Longland found it necessary to appoint two administrators to control its business affairs. But Pescall underhandedly removed the bishop’s two nominees, making it increasingly difficult for the bishop to sort out the abbey’s growing problems. By 1528, the abbey had not improved. Pescall’s conduct had worsened and he rarely attended choir. He never ate with his fellow canons and he received a number of complaints about the excessive number, and also the conduct of the personal servants he employed. Bishop Longland was at the end of his tether and Pescall’s deposition was deemed essential. In the time just before he was deposed, Longland would intervene considerably in the abbey’s day-to-day activities. 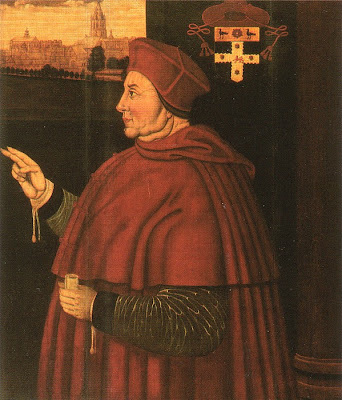 Pescell, knowing his fate, tried to secure his position and future at the abbey by giving presents to Thomas Cromwell, the chief minister to Henry VIII, but after the fate of Cardinal Wolsey at Leicester Abbey in 1530, Pescall resigned and was granted a pension of £100 a year. The new abbot was John Bourchier who was elected in January 1534. Bouchier had a difficult task on his hands as the abbey was £1,000 in debt and Pescall’s pension was an unnecessary additional burden. In the same year, Bourchier with his twenty-five canons acknowledged royal supremecy over the Church and as the abbey’s yearly income made it the richest religious house in Leicestershire, it was allowed to survive Henry VIII’s dissolution of the smaller monastries. After Richard Layton’s visit in 1535, Bourchier was considered a wise and honest man, but Layton’s assessment of the canons was that they were factious and he brought on charges of adultery and unnatural vice against them. Layton took his findings to Thomas Cromwell and although the abbey presented gifts of money, livestock and land, it was finally surrendered in October 1536. Bourchier was successful in reducing the abbey’s debts from £1,000 to £411 and so was given a £200 a year pension for his hard work. Before its dissolution, the abbey only held lands in Leicestershire but was still in possession of the churches of All Saints, St. Leonard, St. Martin, St. Mary de Castro, St. Michael, St. Nicholas and St. Peter, at Leicester, and many more throughout the county. In total, the property owned by the abbey at the time of its dissolution had a net annual value of £786. 16s. 1¾d, all of which were given to the Crown, under the control of Thomas Cromwell. There was something very special about Leicester Abbey, because although Cromwell had a firm belief in the dissolution of monastries, he set up a scheme to try and save Leicester Abbey. Sadly the scheme failed, the canons disbanded and the land was granted to the Marquess of Northampton, who later sold it to the Earl of Huntington. He built a house in the grounds of the abbey, using the abbey’s stone. In 1613, William Cavendish, the first Earl of Devonshire, acquired the property and it became known as Cavendish House. It was used as the headquarters of Charles I before the Battle of Naseby but after the defeat of the royalists, those that remained at Cavendish House plundered it and set it alight. In 1925, the Earl of Dysart offered the 32-acre grounds of Leicester Abbey as a gift to the town council, and the deed was signed on December 31, 1925. The new park was opened in April 1932 and was intended to serve as a recreation ground providing areas of sports such as cricket and tennis. Today you can still view the ruined Cavendish House and the excavated foundations of Leicester Abbey, now a Scheduled Ancient Monument, both of which are major attractions of the beautiful Abbey Park. The abbey is most famous for its connection with Thomas Cardinal Wolsey, Archbishop of York and Lord Chancellor of England. 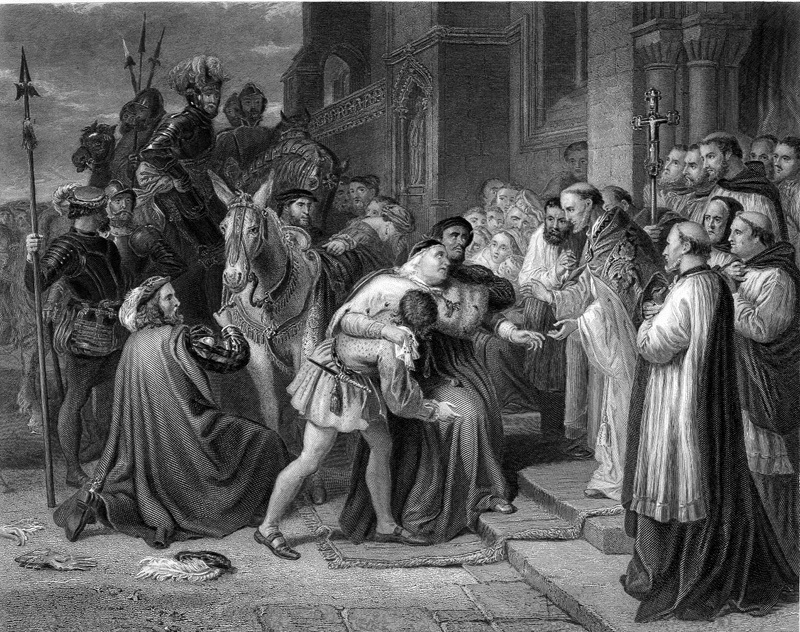 On his arrival at the abbey, he told Abbot Pescall “I am come to leave my bones among you.” Wolsey died that night November 26, 1530. He was buried within the walls of the Abbey church like it’s founder Robert ‘le Bossu.’ In keeping with his practice of erecting magnificent buildings, Wolsey had designed a grand tomb for himself. But due to his hasty death, Henry VIII considered using the impressive black sarcophagus for himself, but Lord Nelson now lies inside it, in the crypt of St. Paul’s Cathedral. Today a monument now stands on Wolsey’s resting place amongst the Abbey ruins on Abbey Park.